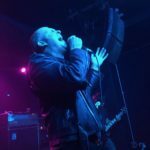 Magic Circle, Sumerlands, Tower at St. Vitus | Rocker For Life! A great night at Vitus! It’s my favorite venue, I just wish it didn’t take me forever to get there – you could watch 2 movies in the time it takes me to enter the hallowed hall – so I am discerning of which shows I attend, just because the commute frikkin’ knocks me out! There were 3 bands on the bill on Friday, January 11th, 2019! Tower were up first, a nice strong local opener with their twin guitar attack and female power vocals. Reminded me of Tank and Thin Lizzy at times but with often higher, stronger vocals. This band has it together, great rhythms and hallowed howls – they totally brought it, a varied set and here’s the fashion part! This band sported: Blue OysterCult, Crucifixion & Sentinel Beast! Follow them on Instagram at TowerNYC. Sumerlands kicked off their set with Seventh Seal and pretty much energized the audience . Arthur Rizk took a break out of his busy production schedule to show up in Brooklyn with the band. There’s obviously an 80s thing going on, and it’s so genuine, it feels like that time as well… Onstage Fashion: Fates Warning, Running Wild, Undergang, Winter, Omen and one BOC tattoo. Great riffs, solid, traditional metal. (part of) BLIND is what you’ll see if you click the video! Looking forward to the follow up to their debut! Magic Circle closed the night. It’s been a couple of years since I’ve seen them. 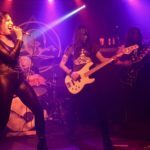 They opened with Lightning Cage – a perfect showcase for them to display their Sabbath worship in the best way! A mesmerizing set, they really bring back the old Sabbath, the early sound with some swagger and beautiful full tones to it. Considering they have no bad songs, it’s easy to say their performance was stellar as well. And to round out the I Spy shirt game: Magma, Sabbath, Winter and Trouble shirts were in attendance. I should also mention that their bassist, Justin is also the drummer of Sumerlands, so a Winter shirt on both lists is not that unusual! Their new record should be out very soon on 20 Buck Spin. The crowd didn’t diminish while any band was onstage! I love seeing support at the shows, it was a super fun evening at St. Vitus Bar!